On my recent trip to Los Angeles for AR 2009, I had the privilege of meeting and sharing a meal with Kevin Boylan, one of the owners of The Veggie Grill. I was so inspired by his story, his business sense, and of course, the amazing food! The Veggie Grill has found the winning formula for healthy, delicious, inexpensive, convenient meals, something this country so desperately needs. The Veggie Grill has served over a half million plant-based meals in 2.5 years. Over 90% of the restaurant’s patrons are non-vegetarian, which really goes to show that the demand is there, and not just for those of us who choose to eat vegan all the time. Although Kevin is very busy with the day-to-day duties surrounding his quickly-growing restaurant chain, he was kind enough to take time to answer some questions for TheTravelingVegetarian.tv. TTV: What are your goals for The Veggie Grill? Are you franchising? KB: Our goal is to become the “Whole Foods” of the restaurant industry, which goes along with our mission statement: “Make it fun to eat wholesome.” We are putting off any decision regarding franchising at this time. Our intent is to continue to own & operate our restaurants for the time being. TTV: Where do you see the business is five years? Ten? KB: We are now positioned to become the first national brand serving wholesome (which we define as 100% plant-based) comfort food. We intend to grow our base from three to six locations over the next twelve months, and then from six to twelve over the following twelve months. At that juncture we will have the infrastructure in place to support an aggressive national roll-out. TTV: Why is The Veggie Grill thriving when so many restaurants and other businesses are failing? KB: We are meeting a need: Delicious food that people can feel good about eating, served by friendly & thoughtful people in an attractive & convenient setting. TTV: What was the process in coming up with the current menu? Was it one chef? Several? KB: After an exhaustive period of due diligence, which included sampling food from coast to coast, we found Ray White who has been working with plant-based recipes for 10+years. We then worked together with Ray to develop the menu that you see today. Our team is constantly striving to improve & innovate, so we add new, delicious items on an ongoing basis. TTV: Is the menu the same at all locations? 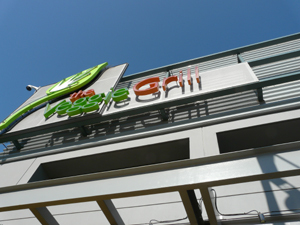 TTV: What would you say is The Veggie Grill’s signature dish? KB: That’s a difficult question, as some guests love the Santa Fe Crispy Chickin’, while others swear by The Stack. However, pretty much everyone is amazed by our Sweetheart Fries & carrot cake. TTV: What’s your favorite thing on the menu? KB: That’s like asking me which one of my children is my favorite! I’m enthralled with all our dishes! TTV: What inspired you to change your eating habits? KB: Our inspiration to adopt a 100% plant-based diet was based upon the overwhelming body of evidence that we discovered as we were researching the food business, which clearly demonstrates the benefits of a plant-based diet. We feel better, and our wives tell us that we look better too; who needs any more inspiration than that! The Veggie Grill has won many well-deserved awards including “Restaurant of the Year” from VegNews Magazine and “Best New Restaurant” in any category from the OC Journal. Delicious food that people can feel good about eating is working very well. I know this Traveling Veg is definitely looking forward to The Veggie Grill coming to Nashville. 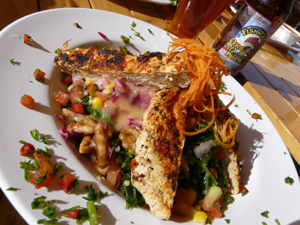 In the meantime, I can’t wait to get back to Southern California for a Bali Bliss with blackened tempeh and avocado and a side of those amazing sweet potato fries! 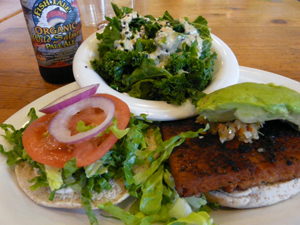 Bali Bliss - Indonesian styled tempeh, sautéed and grilled, lettuce, tomato, red onion, chipotle ranch. Add avocado, portobello mushroom or chili for $1.50. Blackened upon request. All Hail Kale - Marinated organic kale and red cabbage, roasted corn salsa, agave-roasted walnuts with a ginger-papaya vinaigrette. Add blackened chickin’ for $2.50. 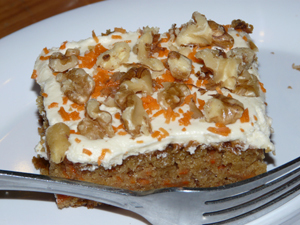 Carrot Cake - Free of dairy, cholesterol and refined sugar - Full of deliciousness! I’ve never been because I try to stay out of LA but when I next go, I will be sure to eat there. Just reading this made me hungry. Now, where’s my All Hail Kale? Wish that I had some. I liked it even better with the blackened tempeh. So good! Nice! I must visit The Veggie Grill. It looks verrrry tasty. They need to come to Canada too!! The food is fantastic! I also think that the restaurant looks great, the staff is welcoming and helpful for those of us who aren’t vegetarians, and I appreciate the attention to little details such as real silverware and plates, interest in patron feedback, etc. It’s a nice experience. You know how you think about companies like Google, that these people just get it. . .
Glad you had a good time in southern California! I love Veggie Grill……they catered my graduation party in May and I’m not joking, even the meat eaters were eating the Veggie Grill items instead of the meat dishes…….we weren’t expecting that! Great interview, its nice to see the direction that Veggie Grill is going. Plant-based, vegan food for the whole society! Rock on, Veggie Grill! Thanks for caring and for serving wholesome food. It looks like the trend right now is (surprised) to be healthy and to take care of ourselves, our families, and our planet. To keep the E (earth), we really need to return to plants and stop killing animals. I grew up in So. Cal, but moved away when I was 18. I visit often and Veggie Grill is one of my favorite places. They have 7 locations now in So. Cal. I have always thought they would do great in Portland and they now have a place outside Portland. All Hale Kale! Met a vegan friend at the El Segundo/Manhattan Beach lofcation today. From the time we arrived (1pm) nearly every table was filled and remained so until we left at 2:30. I’m 100% carnovor, and was concerned meeting at a restaurant named “Veggie Grill” – plant based chickent and beef? WTF???? I ordered the Chicken BBQ with lettus and red onions…. hesitant to take the first bite, once I did ther was no turning back. It was absolutely delicious. I would never have know it wasn’t chicken. I was impressed enough that I’ve search for more info on this chain, only to learn they don’t offer franchises. Good luch, and I’m ther when you decide to go public. This place is amazing. I interned in Irvine, CA last summer, and every day for lunch I would get the papa portebllo sandwich. I was delicious. Someone needs to open one of these in South Florida. It would be a huge hit. Does anyone know how much it cost to open a franchise? I know a great location for the vegi grill, I was hoping that you franchise! The food is great. I go once a week. Being a vegan is indeed difficult when away from home or wanting to dine out. Happened upon Veggi Grill in Carlsbad CA (opened 2 weeks ago). Absolutely delicious with wonderful staff and selection of food. Will return often and hope to find additional locations soon. Highly recommend for anyone vegan or not. Is there any chance you will consider some kind of partnership with a restaurant if not franchise in next few years?!?? Desperate to bring you to the heartland of Ohio .. Clevelanders in desperate need of options just like this! I have the perfect location and investors to make it happen! We have a great location in Central Florida and a great community of residential and commercial businesses comprised of Fortune 500 companies.. It’s a corner lot and traffic controlled, with ingress and egress. Would love to have you locate on the Space Coast. My vegan family LOVES Veggie Grill. We drive 45 minutes once a week to go! Pretty please open one in Santa Cruz, CA! Superb, what a web site it is! This web site gives useful information to us, keep it up. i am browsing this website dailly and take good information from here everyday.